For The Aries Girl: What’s Your Personal Style Statement? Welcome to your birthday month, Aries. We know It’s your favorite time of the year and you are super excited about it! We are here with a special style edition for the Aries woman who is suave, fierce, daring and overall just splendid! Your star sign affects your personal style majorly, especially your fashion tastes, and we are decoding that to give you an insight into what you should splurge on this month! You are confident, spontaneous, adventurous and that’s why you are not scared to experiment with the latest stuff! You are a born leader, which is why you like to personalize fashion trends by adding your own zing to it with your charismatic personality. 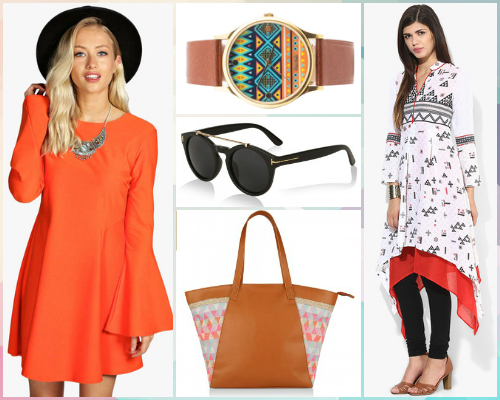 Because you are a fire sign, this resonates in your love for bright hues. Red is your main color. From your lipstick to your shoes, you have a long lasting affair going on with crimson hues. Wearing red makes you feel more powerful and proactive! Pure energy and vibrancy in the rawest form! These Aries celebrities are simply a reflection of your style! Left to Right : Sarah Jessica Parker, Victoria Beckham, Emma Watson Images: Shutterstock When it comes to silhouettes, you like to go for something that is off-beat, out of the ordinary. Be it an interesting neckline, asymmetrical hems, defined lines with a twist is your chosen flavor. You find bright colored outfits and bold statement accessories in angular shapes or sharp edges irresistible and you inevitably pick those from the lot! At a party, you’ve always got all eyes on you, all thanks to your dazzling personality. Thus, wearing red, especially on your birthday seems suitable. Add some unique jewellery like these circular earrings and ring, a pair of pretty golden heels to match your accessories and a clutch that shines. You’re all set to stand out! POPxo Recommends: Off Shoulder Dress(Rs 1,599), Golden Stilettos(Rs 1,695), Glitter Clutch(Rs 499), Circle Ring(Rs 495), Gold Earrings(Rs 500) So here was a breakdown of your style quotient, Aries. Move forward fearlessly and create some sensation in the fashion world! HAVE A STORY IDEA FOR POPxo? If you want to hear about it, we can write about it! Just tell us your idea here! MUST-READ: Beauty for Your Zodiac: What Is Your Hair and Makeup Style? MUST-READ: Will April Be YOUR Month? Here’s What Your Horoscope Says!